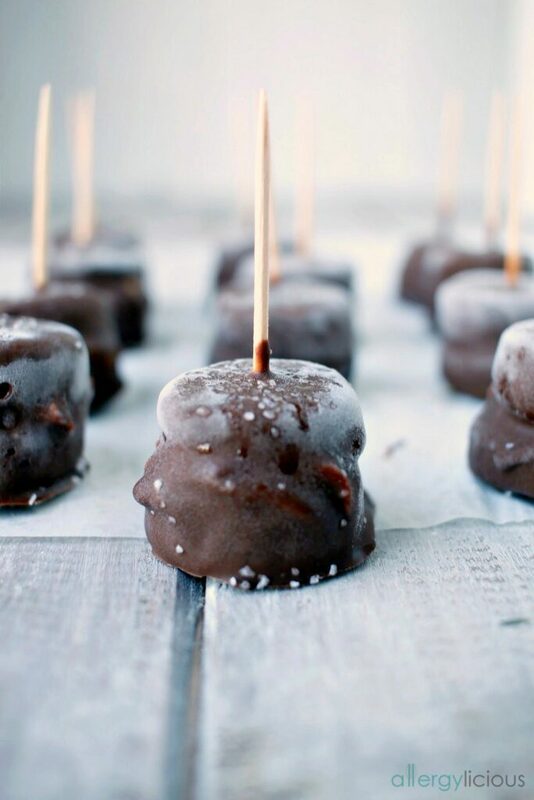 Homemade frozen bites made with real ingredients, like banana & SunButter then covered in Top 8 free chocolate. I was in the mood for a Bon-Bon! It’s really been years since I had one but something about that ice-cream bite, covered in a chocolate shell was calling my name. What was a girl to do? 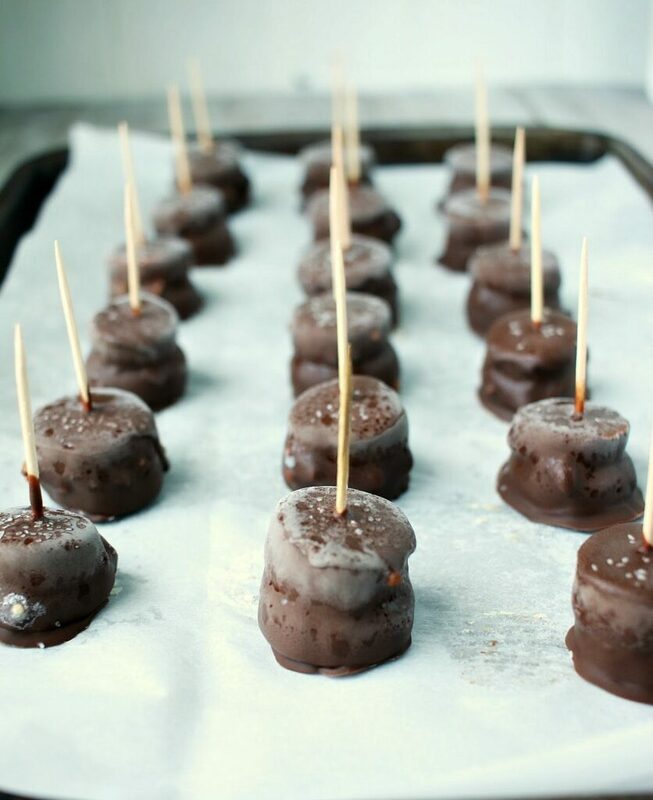 How about make your own frozen Chocolate-covered Banana SunButter Bites! This did the trick. Have you ever heard of or made “nice cream”? It is simply frozen banana slices, blended together to make your own dairy-free, vegan ice cream. 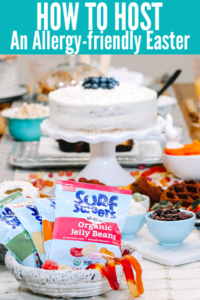 You can add your own toppings, blend in your favorite ingredients like SunButter, vegan caramel or Top 8 free chocolate chips and you’ve made an incredibly healthy, and allergy-safe treat. It’s exactly the frozen bananas in this dessert that make the inside of these bites taste like ice-cream. Be sure to save a few bananas so you can also make these Gluten-free Banana Bars from Fearless Dining, just use your egg replacer to keep it egg-free. I use SunButter anywhere I use to use peanut butter. Smoothies, oatmeal, toast, cookies and treats or even sauces for noodle dishes (keep reading for links to some delicious recipes using SunButter). 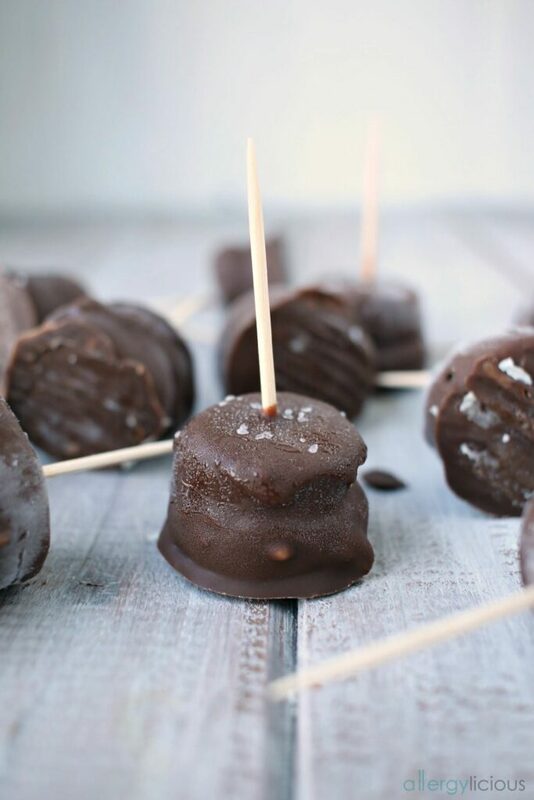 These frozen Banana SunButter Bites have a dollop of SunButter sandwiched between 2 slices of banana which is yummy on its own, but when its frozen, covered in chocolate then sprinkled with a little sea salt, it’s like eating a bite of caramel infused, ice cream bliss. Who doesn’t love chocolate? 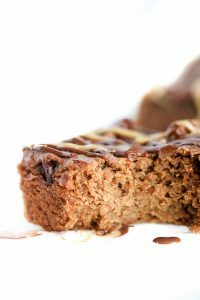 You can search all through this blog and find tasty treats, full of dairy-free chocolatey goodness. Chocolate chip cookies, Cookies & Cream Smoothie, Vegan Chocolate Protein Bites, Chocolate Dipped Red Velvet Cookies, Double Chocolate Pancakes, Vanilla Bean Ice Cream w/Cherry ……the list goes on and on! So when you’re done printing off and “pinning” this one, head over and check out some more. Because a little chocolate does everyone good. Ok, but back to this shell coating! You know those bottles of Magic Shell that you may have poured all over your ice cream as a kid? That’s what this is like. Not only is it great for these Banana SunButter Bites but pour it over your ice cream, top off your brownies, drizzle on your cupcakes, or use it to make candy. It’s so very versatile and hardens perfectly, just like the chocolate shells on the store shelf, but made with only 2 ingredients (did you just do a “happy dance?”). This recipe is so simple, it’s going to be your new fav! I mean, we can all slave in the kitchen trying to make some amazing dessert but these Chocolate-covered Banana SunButter Bites are easy-peasy & delicious. Double-win! Make a batch, eat a few, then freeze the rest so you’ll always have a delicious treat when guests drop by or when you’re craving a bon-bon. You only need a few ingredients and I bet you already have them on hand. Homemade, frozen bites made 5 real ingredients, like banana & SunButter then covered in Top 8 free chocolate. It’s a perfect treat just when you need it! Line a baking sheet with parchment paper. Place SunButter in a piping bag or plastic baggie with corner trimmed off. Place 1/2 of the banana slices on parchment then pipe a small amount of SunButter in the center of each slice. Top with another banana slice and use a toothpick or cocktail fork to hold them together. Freeze 1-2 hours (up to 4) or until frozen. Approximately 15-20 minutes before you are ready to assemble, start making your chocolate shell coating. Melt the chocolate chips in a double boiler over low heat or in a microwave safe bowl, stirring with a plastic spatula every 15 seconds. When it is completely smooth, remove from heat the stir in coconut oil. Let cook before using. Holding the end of the toothpick, dip the banana into the chocolate completely and let excess drip off into bowl. Place back on parchment, sprinkle with sea salt before it hardens and repeat with the rest of banana bites. Enjoy immediately or place back in freezer in a covered container until ready to devour. Store remaining chocolate coating in a mason jar at room temperature up for up to 2 weeks. Reheat over simmering water or in microwave until it liquifies again. Why wouldn’t we want to share this? I mean, who in your life loves chocolate? Who in your life has a food-allergy and could use some goodness? Who do you know who would love an easy recipe using only a few ingredients? A classic little treat to have in the freezer! Yes, always good to have some on hand. We love SunButter in our house! All these recipes look fabulous. Thank you! And the salt on top brings out a new, caramel like flavor. You’ve gotta try it. Thanks Mary Ellen. I couldn’t tell you the last time I had one either, but I sure wanted one! Thankfully this gets the fix I needed. These look amazing! 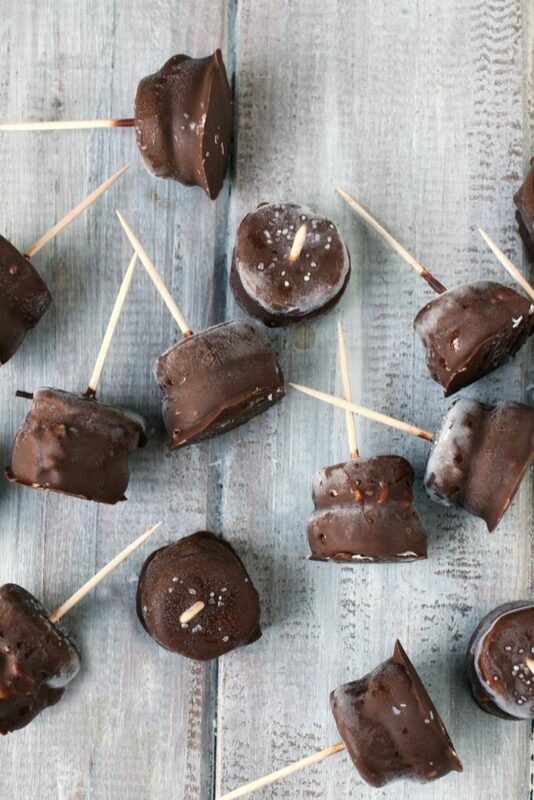 What a perfect little snack to get in your chocolate fix! Oh yes, they taste like little vanilla ice cream bites with a pop of SunButter and Chocolate. Such a perfect snack for the littles! Heck, even me!! 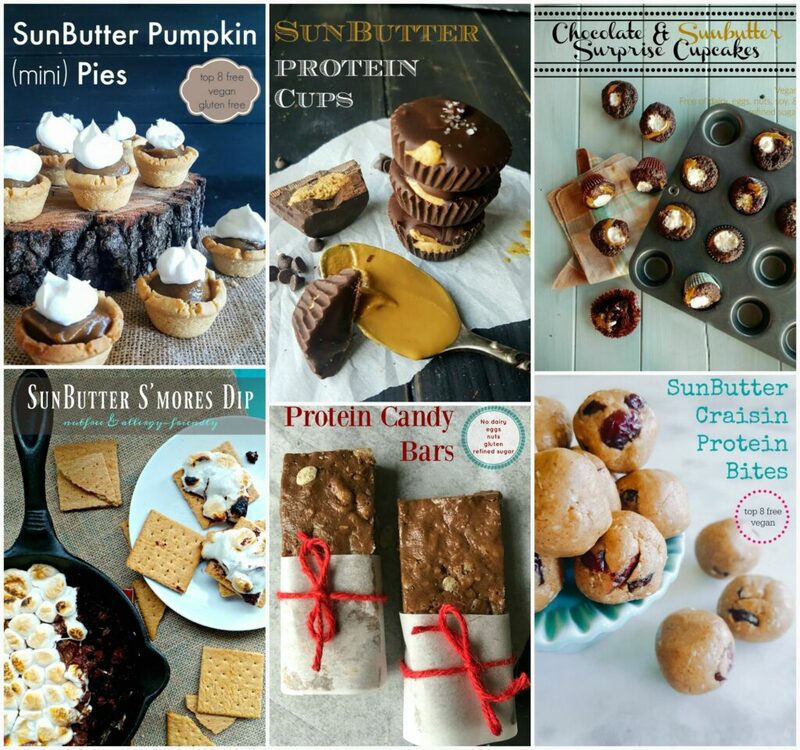 We love frozen bananas and chocolate and the added sunbutter is awesome! I was surprised at how many adults fell in love with this recipe when I had originally intended it for the littles. I guess we all can enjoy a little frozen treat on a stick. It really is that easy! My kids loved helping with it too. I love Sunbutter so I was so excited to see this recipe! Thank you for sharing! These look amazing! I love that they’re made with sun butter. My husband would love these! These are the perfect allergy friendly bites! They’d be great for school snack or treats next time there’s a party! So true! I love having these in the freezer for company. These look so awesome!!! We lvoe sun butter here! Cant wait to try this! Yay for SunButter! It just makes everything better. 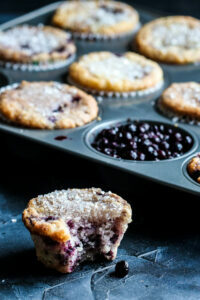 Perfect for sweet cravings, healthy and delicious. Loved it! Couldn’t agree more! Glad you loved them. OH yes, SunButter is our “go-to” for nutfree spread. I don’t miss PB or almond butter at all. I could go for a few of these right now! Perfect little bites of heaven! Thanks Jen. They are so easy to make too for when the craving hits.